Ag Dawgs Abroad Blog | Zipping through the Clouds! 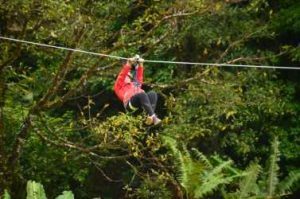 My favorite activity during our study abroad — besides tasting all the wonderful chocolate — would have to be zip-lining over the trees in the rainforest. We were in Abangares, Costa Rica, and the mountain views paired with my adrenaline rush was simply amazing. It was very cloudy that day, so we could only see what was directly ahead of us, and the trees beneath our feet. It was also very windy and wet, but that didn’t hamper our smiles. We got to zipline 7 different lines, and the highest point of elevation was around 12,000 feet. How crazy! At the end of our zip-line adventure, we concluded on a 25 foot high bridge, and you guessed it… only one way down. Free Fall! Just kidding… well not really… we had two choices: 1. get lowered down from the bridge in a harness at a slow speed, or 2. jump off and free fall (in a harness of course) and the bungee jump cords will stop you. I was so nervous, but my friends talked me into jumping, and it was my turn next. Except there was one problem… I couldn’t let go! The zip guide and I talked about it for a few minutes and I decided I was ready. I stepped over to the edge of the bridge and the guide said, “Okay. Jump on 3.” But what I didn’t know was when I counted 1, he “helped” me jump by pushing me to face my fears. The first few milliseconds were scary, but I soon realized I was okay and that this was really fun! What an adventure!!! I also thought about how my Dad was going to react when I told him this story…yikes! This was definitely something I will never forget! Posted in Costa Rica, During trip, Faculty-led, Thanksgiving Break. Bookmark the permalink.